Cross vCenter VM Mobility - CLI is a command line interface (CLI) tool that can be used to migrate and clone one or more VMs (bulk) from one host to another host managed by a linked or isolated vCenter (VC) instance. It has been built using vSphere Java-based SDK APIs. Currently, as of vSphere 6.0, the vSphere HTML5 Web Client allows users to perform Cross-VC operations like migration and cloning if two VCs are linked. If VCs are not linked, users cannot view the infrastructure across multiple VCs and thus, cannot utilize this functionality through UI. This Fling provides a way for users to access this vSphere feature through simple CLI commands. It also supports cross-cluster placement and shared storage vMotion between two VCs. Please see the instructions1.6.0.pdf in the Download box. Relocate is failing with validation error "cln is missing". 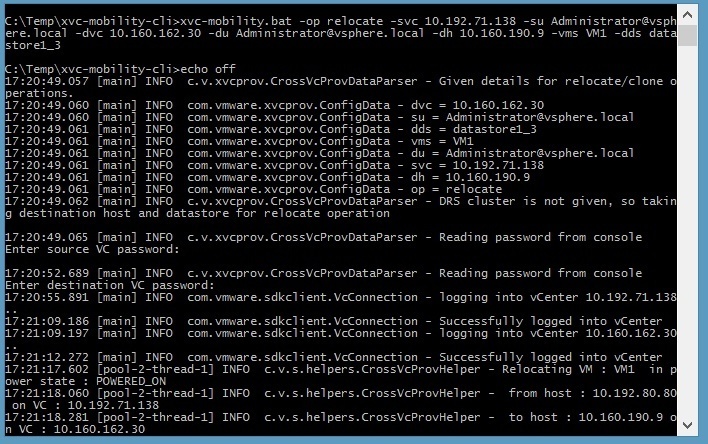 Updated the code to chose destination network details while clone/relocate a vm to destination VC.